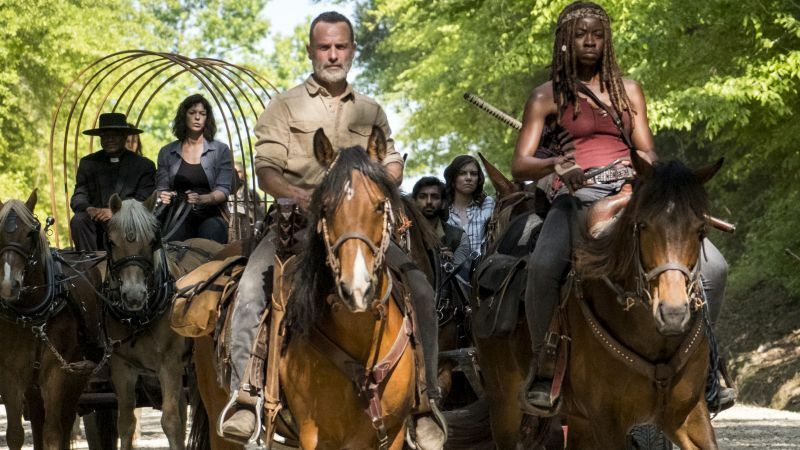 Is Andrew Lincoln Dead, Who is The Wife, What is His Net Worth? Since he picked up the role of the lead character of Rick Grimes in AMC’s post-apocalyptic horror television series The Walking Dead, Andrew Lincoln has been a household name across the world. He played his role as the protagonist of the show for eight years and audiences couldn’t agree more that he is the right guy for the part. Before he began slaying ‘walkers’ (zombies) on the set of AMC’s The Walking Dead, Andrew Lincoln played a few prominent roles in films and series like This Life, Teachers and Love Actually. Nonetheless, they didn’t give his career the kind of vibe that came with his role as Rick Grimes. Meanwhile, the amount of fame he is enjoying today has also made sure he is the subject of numerous speculations and rumors, most of which are damaging. Nevertheless, we gathered some credible facts which you would find interesting about the English actor. Born as Andrew James Clutterbuck on the 14th of September in 1973, Lincoln started acting early in his birthplace of London. Despite the fact that his parents are an English civil engineer and a South African nurse, professionals outside the entertainment industry. While schooling at Beechen Cliff School, Lincoln fell in love with the performing arts and had his first role in his school’s production of Oliver! He was 14 years old when he played the character of the Artful Dodger (Jack Dawkins) in the production. Subsequently, he confirmed his forte in acting after a summer at the London National Youth Theatre and also made up his mind to earn a leaving from it. As a result, he continued his studies at the Royal Academy of Dramatic Art (RADA) and equally adopted the moniker Andrew Lincoln to replace his real name. All geared up for the spotlight, Lincoln grabbed his first on-screen role in 1994, appearing in Births and Deaths, followed by one episode in the sitcom Drop the Dead Donkey. His breakthrough in acting came with the lead role as Edgar “Egg” Cook, in BBC drama This Life. His TV profile continued to flourish with appearances in shows like The Woman in White, The Canterbury Tales, Wuthering Heights, Afterlife, Strike Back, as well as Teachers. He directed three episodes in the latter, scoring a BAFTA recognition at the end. His film collections include Human Traffic, Gangster No. 1, Heartbreaker and others but the one that earned him fame is the 2003 film Love Actually. Aside from series and films, Andrew Lincoln has also had his fair share of plays among which are – Hushabye Mountain (1999), Blue/Orange (2000 and 2001), The Late Henry Moss (2006), and Parlour Song (2009). A career-defining moment came for Lincoln in April 2010 when he landed the leading role in The Walking Dead. Playing Rick Grimes in the AMC series made him a superstar and attracted rave reviews as well as recognition at prestigious awards. For playing the major character in hit series The Walking Dead, Andrew Lincoln gets to smile home with a salary of $650 thousand. The English actor started the show upon its inception in October 2010, thus, gathering up fame as much as his fortune continued to grow. His last reviewed net worth is a comfortable $16 million which is very impressive. Lincoln is a happily married man since June 10, 2006, when he walked down the aisle with his heartthrob Gael Anderson. The two are parents to two kids named Matilda and Arthur. Though Gael comes from an entertainment inclined family, she is not much of a spotlight person. Her father is Ian Anderson, the Scottish rockstar, songwriter and multi-instrumentalist who performs in the positions of lead vocalist, flutist and acoustic guitarist for Jethro Tull, a British rock band. Read Also: Norman Reedus Bio, Son, Wife or Girlfriend, Net Worth, Is He Gay or Married? One thing is certain, the sensational English actor is alive and healthy but the same might not be said for his onscreen character Rick Grimes. At the premiere of the season nine of the series, cast members bid an emotional farewell to him with comments about how he will be missed. Howbeit, they never offered any clear explanation regarding the fate of Rick on the show. Eventually, Lincoln’s time on the show came to an end on episode five of the 9th season when his character was airlifted in a helicopter to an unknown location after a fatal zombie attack. Lincoln’s reason for leaving the show is absolutely amicable. Apparently, he has stayed away from his family for too long and wants to rejoin them in London.